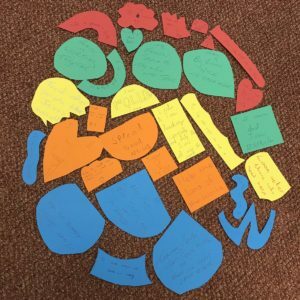 April 2019: It’s been a busy Spring time for our Liverpool Pax Christi group. The group hosted moving and active Liturgy around Ash Wednesday bringing to the public’s attention the destruction caused by nuclear testing and the wasted resources that are invested in nuclear weapons. Planning meetings were also held in Liverpool with our President Archbishop Malcolm who met with Jan Harper and Theresa Alessandro. Liverpools Cenacle Retreat House was the peaceful venue for the Pax Christi day of reflection on April 6th.The pivotal item for reflection was Xavier Beauvois’ 2010 film Of Gods and Men, based on a true story: eight French Trappist monks have established a harmonious and much appreciated relationship with the impoverished local Muslim community in Algeria.Their task is not to proselytise, but to serve, through the provision of clothing, food, employment, medical aid and friendship. All is well until, during the Algerian Civil War, a group of Islamic terrorists invade the monastery and threaten the lives of the monks. Some Croation volunteer workers at the monastery are killed. Should the monks stay or leave? the resulting tense discussions between the monks themselves and the villagers raise questions that are central to peace work today. (This year the WCC recently withdrew its volunteers from Palestine because of the increase in Israeli Settler violence).In the film, the monks decide to stay. Small sharing groups allowed us to explore issues raised by the film, about competing identities, individual and group resistance in face of aggression; loyalty and betrayal; self-preservation/self-sacrifice.These questions lead into Holy Week and a Galileans’ response to betrayal,religious and military aggression, and his means of survival. A simple and meaningful liturgy, celebrated in the chapel, concluded the day”. Special thanks to Jan Harper and the wonderful Pax Christi Liverpool group. Durham Martyrs Parish excelled with their great social media promotion of Peace Sunday and creative work with young people. They developed a children’s liturgy for Peace Sunday and tweeted our prayer for children for all to share. They expanded the topic of Peace at their youth, ‘Base Camp’ asking the question ‘How can we share the Good News and be peacemakers in the world.” This is what they produced. 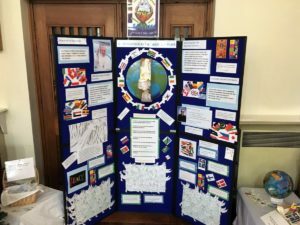 Sr. Margaret Chambers (SND) decided to combine the theme’s of Christian Unity with those of Peace Sunday and told Pax Christi: “We planned the service using the Unity booklet and the Peace Sunday book – so it was a real combined service for Justice and Peace. I was really happy with the congregation who meet every Sunday, they all came and joined in well. I think Ecumenism and Peace are not exactly understood – Its sad but we still keep trying! We pray about it and I find the Pax Christi daily prayer for peace is great. It really is a good examination of conscience”. Anne Dodd from Abingdon wrote: I spoke at the end of all Masses, most people took envelopes. Prayer cards, info leaflets were distributed and we created a small display of info Pax Christi. used. Copies of full text of Pope`s Message made available. Good response generally. To have a suggested script on- line for Peace Sunday is I think a REALLY good resource. It can be adapted, tweaked or just extracted from but it gives members something to start off with and gives confidence to first-timers. The parish of Our Lady of Mount Carmel & Saint George, Enfield tweeted: Well done to our Confirmation candidates and catechists for preparing beautiful peace shrine in the church to this Peace Sunday. Please do drop into the church this week and visit the shrine and say a prayer for peace in the world. Article – not used, but may be included in a future magazine. So we tried to do our ‘bit’. Maureen Wilcock from Liverpool reported: Liverpool Members were welcomed at the three weekend masses (Christ the King and Our Lady Parish) for Peace Sunday. The newsletter highlighted Pope Francis’s peace message and Fr. John Poland drew extensively on ideas in the Peace booklet for the bidding prayers and homily. We ran a stall and enjoyed talking to people while displaying information and giving out prayer cards, badges and news of future events. We plan to follow up Peace Sunday by visits to parish groups to talk about Pax Christi’s aims and campaigns. Thanks to Christ the King church for our welcome and to Fr. John for his excellent sermon really making clear what it means to be a follower of Christ, the ‘Prince of Peace’. The Justice and Peace Group in St Mellitus Parish, Tollington Park wrote an article for the parish newsletter on the theme for Peace Sunday and involved the Confirmation group in a dialogue on the theme at the Homily slot. Members also spoke at Mass which made a substantial difference to the collection taken! 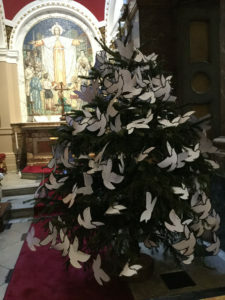 From St Wilfrid’s Church, Preston, Geoff Thompson sent us a picture of the Peace Tree which they created for Peace Sunday – recycling their Christmas Tree. They asked everyone to write a place, person, situation or country they personally wanted to pray for peace for, then hang it on the tree after the bidding prayers. Most people did. Holy Apostle Parish, Pimlico, devoted the front page of their newseltter to Pax Christi and the Peace Sunday theme and reproduced our Prayer Card in the newsletter too. It was encouraging to see schools ‘tweeting’ about Peace Sunday too. 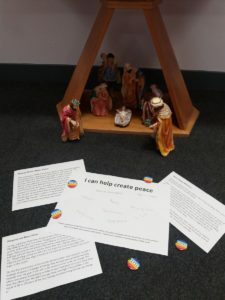 Two schools, which our education worker Aisling has worked with in recent months, Sacred Heart Hammersmith had Peace as their prayer theme for the week and Holy Family Waltham, facilitated a discussion with Year 9 Justice and Peace Group on the theme “How can I help crate peace”. They also gave out Pax Christi peace badges!